So you want to learn the actual HTML elements and attributes and how to use them, as well as how to use CSS properties. Great! We've created this page with advice for anyone who would like to start learning HTML & CSS. This page is for those who want to learn the "old fashioned" way, by learning what HTML elements like html, head, meta, p, etc. are for and how they're used. It's not for those who want to use an HTML editing program that hides the actual HTML & CSS source from you (also called a WYSIWYG editor for What You See Is What You Get). Did you know? You don't need a web server or web hosting service to learn and create HTML pages. You can work right from your own computer, and even install a free web server with a database and PHP that you can use to learn and develop with (search "WAMP software" or "LAMP software" on the Internet). When you want to publish your pages to the world then you will need to find a web server to upload your pages to, but before then, there's no need for a web server or web host. To get started learning HTML, we recommend a good HTML editor. You can use just a regular text editor, but we highly recommend our product, CSS HTML Validator for Windows. 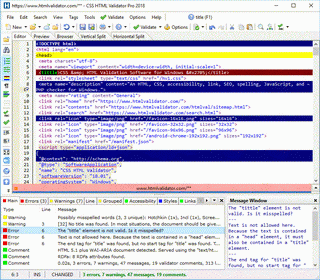 It's not only an HTML editor, it will also check your HTML & CSS for problems. It's a great learning tool and you can even use it for free for personal, non-commercial use. If you choose to install CSS HTML Validator then it will be very easy to check your HTML and CSS (just press F6). You can also place the cursor by any HTML element or CSS property and press F1 to get an instant help page. Classroom and student discounts are available. If you want to buy a book for beginners then we recommend these books for learning HTML, CSS, and other web technologies and languages. These books underwent a technical review (in whole or part) by Albert Wiersch, the developer of CSS HTML Validator. It's also hard to go wrong with other books that have been well reviewed by many people on Amazon. Consider taking an online HTML and CSS class on Udemy.com (new window) The below video is from a beginner CSS course offered by Andy Williams on Udemy.com. The course name is CSS - Comprehensive CSS for beginners. It's a short introduction to CSS HTML Validator. You can also access many free video tutorials at Guru99 (new window). You'll also want to get one or more HTML tutorials. There are plenty on the web. Just search Google (new window) for "HTML tutorial". HTML Tutorial at HTML.net (new window) - This HTML tutorial will give you an easy, yet thorough and correct introduction on how to make websites. The tutorial starts from scratch and requires absolutely no prior knowledge of programming. HTML Tutorial at udemy.com (new window) - Tutorial to help you get started with the foundations & lingo of HTML5. CSS Tutorial at HTML.net (new window) - This easy to understand CSS tutorial will get you started with CSS in just a few minutes. If you run into a question while learning (who doesn't?) then you may want to post it in our online support forum. There are forums for HTML, CSS, search engine optimization, scripting, and more. The VIP code you'll need to register for a forum account (if you don't already have one) is 73205. This helps prevent forum spam. Along with HTML, you should learn CSS because the two languages go hand-in-hand. Using CSS (cascading style sheets), you can control the layout of the page as well as things like colors, borders, margins, backgrounds, styles, fonts, and more. The good HTML tutorials should mix learning CSS with HTML. Then, just start reading the HTML material you've found and start creating your first HTML pages. Don't forget about checking your work, either with CSS HTML Validator or another HTML validator or syntax checker. By checking your work, you'll already be well ahead of the many web developers who ignore or give little thought to the problem of badly constructed HTML & CSS. If you install any current edition of CSS HTML Validator on your computer, then you can place the cursor near an HTML element or CSS property and press F1 to instantly bring up a help page for that element or property. If you're not using CSS HTML Validator, then check whatever editor you're using for similar help features. CSS HTML Validator Forums - Includes discussion groups to ask HTML, CSS, and other web development related questions.